Sickle cell anemia is an inherited anemia. It only affects individuals with a specific mutation in the gene that controls production of hemoglobin. 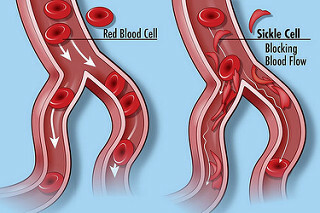 In patients suffering from sickle cell anemia red blood cells become rigid which makes them more fragile. This way the majority of red blood cells do not live long enough to perform their duty - transfer of oxygen to all the body cells. Since there is chronic damage to red blood cells and insufficient supply of the body tissues with oxygen it is obvious that some symptoms and signs of sickle cell anemia are related to the lack of oxygen. Furthermore, as a result of uncontrollable damage to red blood cells, many substances are released, they accumulate and are also blamed for certain characteristics of the disease. Sickle cell anemia commonly causes fatigue and there are periodic episodes of pain. Pain develops as a consequence of blockage of blood flow through tiny vessels in the chest, abdomen or joints. Some patients complain about pain in the bones. Such pain ranges in intensity and may last from several hours to even a few weeks. In babies the first sign of the condition may be swelling of hands and feet. Patients suffering from sickle cell anemia develop frequent infections and the condition may cause delayed growth as well as vision problems due to damage to the retina. The only cure for patients suffering from sickle cell anemia is bone marrow transplantation. Until the adequate donor is found patients undergo different treatments. There are several groups of medications used for sickle cell anemia. They include antibiotics (treatment and prevention of infections), pain relieving medications (treatment of pain during a sickle crisis) and hydrohyurea (the drug that can reduce frequency of painful crises). Supplemental oxygen is helpful in a sickle cell crisis. Since children suffering from sickle cell anemia are more susceptible to infections they may benefit from vaccination. Another way to help such patients is to give them transfusions containing only red blood cells. Blood transfusions must be administered carefully because they may raise the amount of iron and excess of iron is related to potential damage to many organs such as heart or liver. It may be necessary for some patients to undergo surgical procedures such as splenectomy (surgical removal of the spleen) or surgery of the eye that deals with damage to the retina. And finally, there are several experimental treatments for this condition. They include gene therapy, treatment with nitric oxide, and drugs that can boost fetal hemoglobin production. How is aplastic anemia related to chloramphenicol?